Flying twice across the vast and mighty Pacific Ocean, which I just did on a two-week trip to Australia, found me thinking of, among other things, whales. They're out there, you know, calmly going about the various watery escapades that make up a cetacean-sized life: humpback whales and blues, sei whales and fin and minke, California gray whales and orca. Of course I wasn't able to see them from 35,000 feet or in the pitch of night, but I felt their presence just the same. Felt it like I do every time I gaze west from the shore of northern California. After being hunted to the brink of extinction the Southern right whale (named so because it was the "right" one to slaughter for high quality whale oil) has returned to Hobart Sound, where the Derwent River meets the Southern Ocean. Not many, mind you, but recently a few individuals have started to show back up in what was once their traditional stomping grounds. This I heard from Martin Turmine, Senior Client Manager/Department of Economic Development and Tourism, and as we chatted about life in Tasmania. Yup, Tasmania. If I had to name some of the far corners of the earth the small Australian state south of "The Big Island", as the Tasmanian people call the rest of AU, would surely make the list. I'm not sure what exactly I expected to find, but now that I've been there I realize it's not so far removed - especially if you live in Melbourne - and has become a regular tourist destination with its own bona fide wine route, with modern hotels and hip restaurants and cellar doors, with beautiful beaches and hiking and scads of other outdoor recreation. In fact, based on my two and a half day visit it seems like life in Tas - as it's fondly known - is indeed a blessed one. Pristine seafood, grass-fed beef, lamb and other naturally raised meats, extraordinary local cheese, a cornucopia of fresh fruits and vegetables, charming towns and seaside villages, some of the cleanest air on the planet, and an energy supply based primarily on hydro-electric power makes for one of the loveliest, greenest spots on the planet. The vineyards of Tas account for a mere .5% of Australian grape growing and wine production, but it's a exciting time down there. The local wineries know it, as do the big multinational companies that are eyeing the land and the quality of fruit in the vineyards. The flight from San Francisco to Sydney - 14 hours going and 12.5 on the return - also made me realize again what a miracle it is to live in the 21st Century. Just a few generations ago any trip to The Land Down Under would have taken months, and the visit certainly would not - could not - have been for a brief two weeks. "Hey mom, I'm heading to Australia. I'm back a week from Friday, so can you stop over on Saturday and water my plants?" How's this: "Hey mom, I'm heading to Australia. Have a good life." Alas, the trip meant that hiking in the Marin Headlands was temporarily put on hold; replaced instead with an alarming amount of travel and a schedule crammed with winery visits, pruning demonstrations, wine tasting, vineyard walks, wine seminars, two-hour lunches and three-hour dinners, lots of time on a bus and on a plane, a cleansing beer or two, early wake up calls and late nights. During our 12 days in Oz we made stops in Sydney and the Hunter Valley in New South Wales; the Clare, Barossa and Eden Valleys plus Adelaide and the Adelaide Hills in South Australia; Hobart and Launceston in Tasmania; Sunbury, the Macedon Ranges and Melbourne in Victoria. It was a whirlwind excursion, with next to zero free time, but we did manage to track down koalas in the wild and watch three Tasmanian devils devour a chuck of kangaroo meat, bones and all. Oh yes, kangaroos...there's a lot of 'em. Mobs, even. But back to whales, those a bit closer to home. The annual California gray whale migration from the lagoons of the Baja peninsula to the Arctic's Bering and Chukchi Sea is pretty much over this far south; the peak in Northern California is usually end of March and into April, with moms and newborns at the tail end. Also once hunted to the brink of oblivion, the population along the west coast of North America has rebounded to estimates of over 22,000 individuals since endangered species protection in the 1970's. But Eschrichtius robustus - that's the scientific name - is just one of the great whales that frequents the eastern Pacific. So if you're into whales then get ready, because the feature presentation, the main event, is heading our way, and it can be simply spectacular! You gotta have sea legs and an iron stomach, though, as these giants don't swim up the coast like the grays in spring. You have to hop on a boat and travel 27 miles west of the Golden Gate to find them, to one of the handful of places in the world where the combination of seasonal winds and underwater topography serves up a smorgasbord of microscopic plants and animals every summer. The phenomenon is called upwelling, and off the California coast the resulting bloom of phytoplankton and zooplankton forms the basis of a colossal food chain that krill, a tiny shrimp-like creature, happen to find very tasty. Everything else, from small fish to the largest creature of earth, just loves krill (or the things that love krill). So set the table and let the feeding frenzy begin! Then read on: to a time some time ago, but to a memory that lingers still. When summer on the north coast of California returns, so do the great whales that have spent the winter months relaxing in the tropics. They must be smarter than we think, traveling every year to the warm waters of Costa Rica, Hawaii, and Mexico. I would follow them if I could but work and other responsibilities beckon, so it is reassuring to know that, barring any obscene global disaster, the whales will return year after year to their traditional feeding grounds surrounding the Farallon Islands. If you live in, or are visiting, the San Francisco Bay Area and have not yet traveled into their waters, plan ahead and do it during the foggy summer months of July, August, September, even October. You will certainly visit a unique and fascinating aquatic landscape, probably see wildlife along the way, and just maybe have one of the most memorable natural experiences of your life. August 12, 2002 was my third voyage with the Fort Mason-based Oceanic Society, my third adventure into the Gulf of the Farallones National Marine Sanctuary and out to the rocky islands, twenty-seven miles off the coast of San Francisco. Since then I’ve been out another dozen times and can honestly say that every single trip was highlighted by some fantastic aquatic encounter, some that I will remember forever. 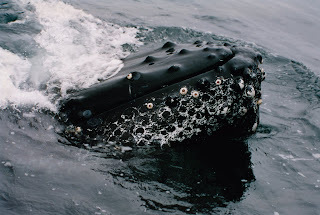 On that first excursion years ago our boat came upon a group of feeding humpback whales. They were very near the boat but had no interest in us as they lunged relentlessly out of the choppy water, baleen-fringed mouths agape, intent only on the pursuit of food. After the feeding frenzy one of the massive adult whales breached off the starboard side. Pleasantly stunned and back on land I realized that I could never again look out on the vast and seemingly empty Pacific Ocean without remembering that below the surface it teemed with such life. My second trip on September 10, 2001 was short on whales but long on other wildlife: harbor porpoise, Dall’s porpoise, sharks, sea lions, and hundreds and hundreds of dolphins! Twice during the bright blue, sunny day huge schools of Pacific white-sided dolphin and the rare northern right whale dolphin surrounded our boat, riding the bow waves and wake, spinning, leaping, flipping, zipping through the water as far as our eyes could see. It was a joyous ride, and the humans on board cheered, whooped and hollered in excitement, unaware that come morning our peaceful, carefree vision of nature would be shattered by the demonic acts of man. If someone had told me before steaming through the Golden Gate in 2002 that we would witness an hour-long “friendly” encounter with two forty-five foot humpback whales out past the Farallones, on the edge of the continental shelf, I surely would have wished it so but not really believed them. If they told me we would espy a pair of blue whales just off the boat - even get a peek at their massive flukes as they sounded - I might start to dismiss their wild vision as a bit crazy. As they kept talking and vowed that we would also catch seven or eight consecutive breaches off in the distance and watch some playful, powerful tail lobbing by even more humpbacks, I would have thought, yeah, keep dreaming! And if they assured me that all this would take place in conditions so utterly windless, on a Pacific Ocean so perfectly glassy you could water-ski on it, I would have known they were totally bonkers. Well insane or not, it happened, and my fellow passengers and I still talk about that surreal, extraordinary voyage in awed, reverent tones; it still brings a smile as we remember. We returned from the aquatic odyssey shaking our heads in disbelief, but like a Scratch-N-Sniff picture we not only saw it, we smelled it. Like the movie Earthquake it was played in Sense-A-Round. We felt it. Our two-hour boat ride to the Farallones was uneventful. Skies were overcast but visibility superb on the surface, the water smooth and shiny as buckets of molten lead. Once we neared the craggy islands, however, nature finally started to reveal itself. Leaning over the rail of the boat we watched huge schools of transparent moon jellyfish and burnt-orange sea nettles drift by under water, tentacles outstretched in search of microscopic food. A few odd-looking sunfish lazed and flapped on the placid, gray-green surface, and to our delight several tufted puffins flew by and bobbed comically on the water. On my previous trips Captain Mick had gently eased his boat, the Superfish, in to Fisherman’s Bay for a close-up view of the pinipeds and birds inhabiting the rocky shore and cliffs, but for some reason we spent little time at the islands. We were obviously destined for a date with other sights. About a mile west of the Farallones, on the edge of the continental shelf, we found it: our first lone humpback. Whale watching always seems just a bit magical to me, the air above their watery expanse electric with the anticipation of a possible sighting. Seeing that first misty spout on the horizon never fails to inspire excited “oohs” and “aahs” from us landlubbers. Staring intently, hopefully, until the whale arches it’s broad back and finally catching a glimpse of the flukes as it gracefully sounds never fails to elicit reverent cheers and applause all around. Our humpback did not disappoint, several times lifting its beautiful gray and white tail high in the air, effortlessly slipping below the surface. We drifted for ten minutes as it calmly went about whale things; then we headed off in search of more, the captain avowing that we had just seen our first humpback. And sure enough, in no time we sighted one…no, two more whales. Then a third, fourth, and a fifth. Suddenly the Superfish was surrounded, and these humpbacks didn’t seem to be going anywhere. They lazed and rolled, flopped and cavorted on the unbelievably flat Pacific Ocean. Captain Mick again shut off the motor, all was silent, and with barely a breeze we floated. Spouts, fins, flukes were everywhere, maybe fifty yards from the boat. Had we left for shore then I think everyone would have been happy, yet we stayed, and for the next hour watched in utter amazement as a few distant humpbacks broke away from those circling the boat and swam closer. From the bow a wild, surprised scream erupted as two mighty leviathans thundered up from the deep, alarmingly close and catching us all off guard. A moment later a whale surfaced behind us, then another portside, then starboard. 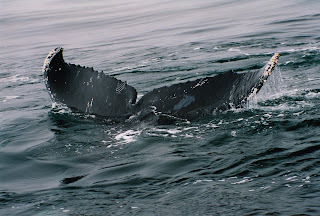 In pandemonium we stumbled back and forth around the boat as even more humpbacks surfaced and dove, some side by side. As the whales disappeared our laughter and screams gave way to an eerie silence. Somewhere, very near the boat the whales swam, invisible beneath us. The air prickled with tension. Then again by the stern they exploded to the surface with a frothy blow and a monstrous trumpeting sound that shuddered all around. The blubber on their backs quivered and shook. Ghostly white pectoral fins shone up from the deep. The whales were now mere feet from the boat, so close you could see small scars and barnacles adorning their dense grayish-black skin. They poked their bizarre, bumpy snouts from the sea, rolled belly up, and swished their powerful flukes back and forth. Fantastic, monstrous screeching noises, low grunts, groans, whistles, and long drawn out fog horn blasts: an alien vocabulary reverberated through the still air. Again and again, closer and closer, two whales, sometimes three, rose and then magically sank beneath the water, leaving silvery-blue ripples and a stunned audience on the surface. That, and their breath. I could not remember smelling whale breath before. Afterwards I knew I would never forget it. Time after time the massive humpbacks roared up next to our boat, exhaling geysers of vapor and mist, life and death, through their grotesque blowholes. Seconds later passengers covered their mouths or retreated with disgust to the other side of the boat to escape the oily, putrid stench that followed. It permeated the air and clung to our clothing. I swore I could still smell the rotting odor back on land. It was at once wretched and wonderful. For almost an hour our boat floated. We were in The Zone, obviously being treated to some cosmic, wild and wonderful encounter with another species, an encounter that left us all wondering: Who was really watching who? The unbelievable scene surrounding us played out in slow motion and in monotones of gray, further adding to the day’s dream-like quality. From the pale gray of the high clouds that hung overhead to the dark, blue-green gray of the pacific swimming pool underneath, the surreal events unfolded. Off in the distance the murky silhouette of the Farallones loomed vaguely. Ripples of platinum sparkled off the glassy sea and at our feet the glorious, thundering, shimmering, slate black leviathans melted in and out of the water. A gaggle of chocolate and charcoal-colored California sea lions, probably out from the islands, paraded noisily back and forth. Vying for our attention they clamored about and barked at us, but we remained mesmerized by the humpback whales and their increasingly curious behavior. My last and most potent image of the two humpbacks that braved the closest encounter and graced us with their majesty was looking directly over the rail of the Superfish into the clear, calm Pacific Ocean. Hovering motionless in the water, staring straight back up at me, was a fifty-ton behemoth. Ever so slowly it nosed toward the plane separating our worlds. With mind-boggling control the whale eased its towering snout skyward and hung suspended before us, a whole world of algae and sea creatures clinging to the mottled grooves on its throat. Had we been a foot closer someone might have touched this obviously inquisitive giant. Time stopped. The whale was looking at us. Then just as silently the humpback slipped back into the sea. Awe-struck and breathless we watched a second whale repeat the exact same performance at the bow of the boat, inches from the rest of the passengers up front. The next time we saw the two they were calmly swimming away, out toward their brethren. It was over. The dream, however, continued. Captain Mick suggested we go find some blue whales and just as easily we did. Big humpbacks are almost fifty feet in length, one hundred thousand pounds, the length of our boat for the day, but an adult blue whale can stretch to one hundred feet, double the weight, and we soon had two within sight. The Oceanic Society naturalist on board for the trip mentioned the rarity of seeing the flukes of the blue when they sound. The words were barely out before the largest mammal on Earth lifted, in slow motion, its twenty-five foot wide tail high in salute and dove beneath the sea. We scanned the surface and watched the time. Over twelve minutes passed before it came back up for air. Several blows later the blue whale sounded again. We waited. But our search was interrupted by the sound of someone shouting. Back behind us, perhaps toward the whales we had just left, humpbacks were leaping from the water. They were well in the distance but easy to discern as they vaulted one by one out of the sea and crashed down in a wall of foam. Through my binoculars I watched, amazed, as one raised its back end high above the water and then slapped the surface with its mighty flukes over and over. Absolutely magnificent! Alas, soon after that most powerful and spectacular display the time came for our reluctant return to land; we said our good-byes and turned back toward the Golden Gate. It’s not very scientific, but I have a theory about what happened that strange and beautiful August day. We stumbled upon some very content humpback whales; by the smell they had surely been eating well. The water was calm and peaceful - a rare occurrence on the windy Pacific - and with the motor off the boat hung in the water, noiseless, harmless. Conditions perfect for a bit of reconnaissance. While the whales remained relaxed, several tentatively began to check us out, swimming closer and closer and seeing how far they could push the envelope. The daring experiment culminated in the two intimate spy-hops just feet from us humans. Unharmed, sated, and perhaps just as happy by the success of the sojourn as the forty whale watchers on board the Superfish, the two brave humpbacks swam back out to the rest of the group to celebrate the experience. This we witnessed from afar as they slapped the surface with their flukes and jumped from the water with joy. If we were fifty tons of blubber and able to breach we all might have done the same. That's it for now, my fellow human beans. Hopefully this coming Sunday will find me back on the trail. The trip to the winelands of Australia was a fantastic, once-in-a-lifetime experience, but after two weeks of 5000 calorie days I could use the exercise, and a salad.